Beautifinous. : Yves Rocher Temptation Days Special! From mid-November until the 31st of December, Yves Rocher will be running a competition to win one of four different beauty sets: a sweet set, 100% healthy set, sunny set or a trendy set. Each set will consist of between 8-10 products and they have a whopping 170 up for grabs! To enter, make sure that you keep an eye on the Yves Rocher website or my Twitter feed where I'll post more again when it is live. UPDATE: The game is now live! Check it out HERE! What beauty lover doesn't love a fantastic collection of beauty products at amazing discounts?! 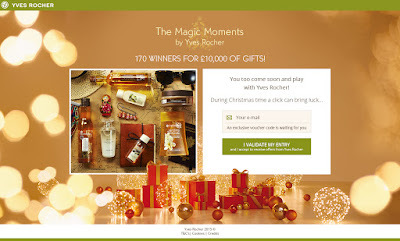 So, are you as excited for the Yves Rocher Temptation Days offers as I am?